Festive cargo, particularly from e-commerce firms, helped truck rentals post a 15-20% increase in October despite two diesel price hikes. Rentals surged 6-7% on trunk routes but as expected, heavy duty truck sales growth slowed to 15%-17% for different variants in October 2015 as against 28%-30% increase last month, said an Indian Foundation of Transport Research & Training (IFTRT) monthly report. 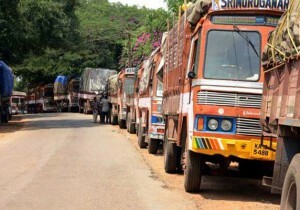 “The despatches of consumer durables, electronic goods, furniture and fixture items, gifts, novelties, dry fruits and 20%-25% increased arrival of apple and orange from cold storages on medium and long haulage has come as shot in arm to the truckers with improved fleet utilization,” said SP Singh, senior fellow and coordinator, IFTRT. Apart from festival demand, the political excitement in Bihar also had an impact on truck rentals. “To some extent, phenomenal spending by leading political outfits in the Bihar state elections too has added demand for large number of items and increased demand for cargo trucks in the eastern region of the country, this too strengthened the truck rentals,” said Singh. The stifled sale of intermediate commercial vehicles and shrinking of growth in heavy truck segment to 15%-17% for various variants during October 2015 as against 28%-30% increase in September 2015 was on expected lines because the price hike of 3% – 4% post mandatory fitment of Anti-break system (ABS) and speed governor from October 1, 2015, said the report. “The surge in truck sales during H1 was largely on account of low base and increase in replacement demand,” said Singh. “As investment cycle under the present regime at the Centre has to pick up for infrastructure sector, the small fleet owners are still on wait and watch mode. There is a undercurrent of rejig in fleet owning pattern as large transport firm and retail booking and delivery companies are in a truck fleet expansion mode. Not only this, large number of small fleet owners are getting marginalised from the market for last 2 to 3 quarters in various trucking centres particularly in Northern India. While, demand for multi-axle heavy trucks and trailers for mining sector should see a revival in next fiscal, the overall mood in the trucking business is somewhat confused,” said Singh.